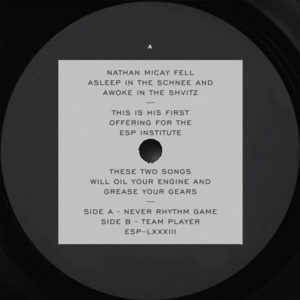 Nathan Micay fell asleep in the schnee and awoke in the shvitz. Side A’s Never Rhythm Game is a bubbling cauldron of acid worms, almost seven steady minutes of liquid squelch and bleep riding on a rolling assortment of booming kicks and claps, all glued together by a droning string and soaring feedback modulation. Aimed for peak time, this big-room monster is built on a major chord that carries us to the perfect rave apex, and functions as a pivot from where DJs can steer into any subsequent direction. 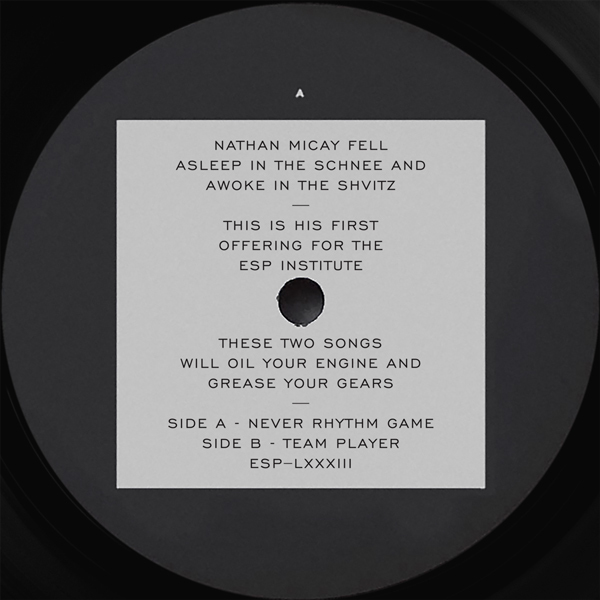 Side B’s Team Player is equally poignant, yet in contrast to its optimistic predecessor, here we join in a dark mechanical affair that summons influence from a distant sci-fi metropolis – sophisticated metallic rhythms that are not polished but scrubbed with steel wool, and lead by a seductive robot that chants degenerate dancing instructions. These two songs will oil your engine and grease your gears.